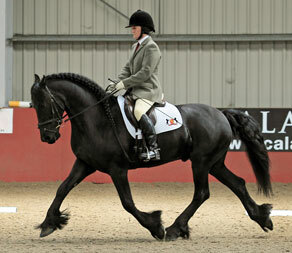 Friesians are now being accepted as a top class Sports horse and they are seen more frequently in the dressage arena. 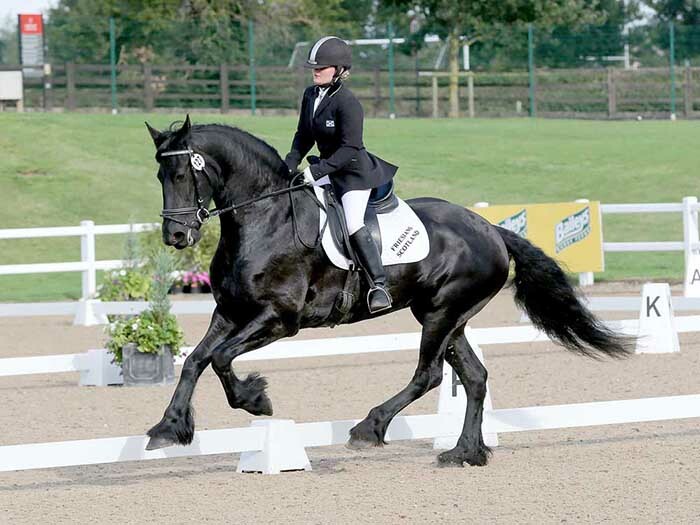 Gold members of FHAGBI can gain access to a series of articles specifically about training the Friesian horse in dressage via the KFPS website. To obtain a username and password please email the KFPS directly with your FHAGBI membership number. The articles are located in the Library section of the website. The leagues will run from 1st January to 31st December each year. The rider must be a FHAGBI member, either gold, silver or bronze. The horse must be KFPS registered, it need not be owned by the rider. Scores are based on horse/rider combinations. The same horse with a different rider, and the same rider with different horses are all scored as separate combinations. Only scores obtained during the period of a rider's membership will be counted. For example - a person joining FHAGBI in August cannot declare scores they obtained in January to July of that year. Only scores of 60% and over count, they accrue points on the same scale British Dressage use (however weighting will apply - see each league for further information). A combination can take part in both leagues, however cannot compete in the unaffiliated league at a level lower than they are competing at BD. There is a league at every level - Intro upwards. There will be a prize for first place at each level. A combination who wins the Intro league in any given year cannot compete at Intro in subsequent years. You can enter leagues at two consecutive levels e.g. Intro/Prelim, Prelim/Novice, Novice/ Elementary. If you submit Elementary scores you cannot compete in the Prelim league, likewise Novice/Intro. 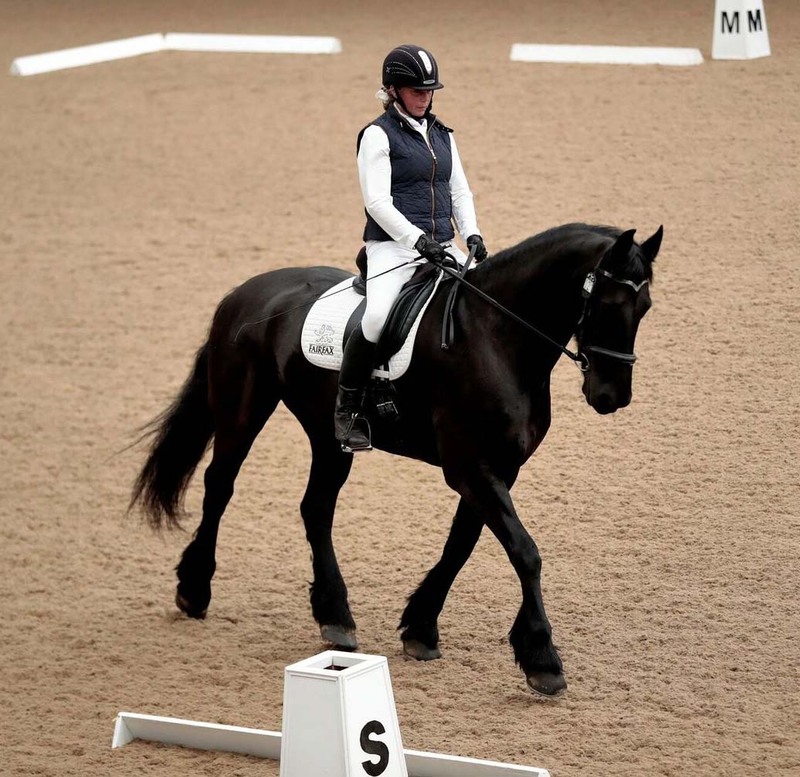 Scores 60% and over from unaffiliated dressage competitions will count in the league. There will be no weighting of points except for Dressage Anywhere (video) competitions where points at all levels will be given a weight of half. Competitors need to email/message photos of their unaffiliated score sheets to Helen Sinclair. The sheet needs to show the date/name of horse and rider/score. Please do not hoard them and send them all in at once at the end of the year. There is one prize/trophy for the overall winner of the league. The winner is the combination with most points. Only scores posted on the BD website will count, a weighting will be applied to these to reflect the difficulty of the test. Team Quest and all music tests (irrespective of level of test) will also be scored at half weight as these tests are not given grading points by BD. There is no need to send test sheets in, your scores will be accessed direct from the BD database. It can take weeks for the BD website to be updated with all scores. Those taking part in the affiliated league should email Helen Sinclair at the end of the league year, when they have assessed that all their scores are showing on the BD website and are ready for the final count. 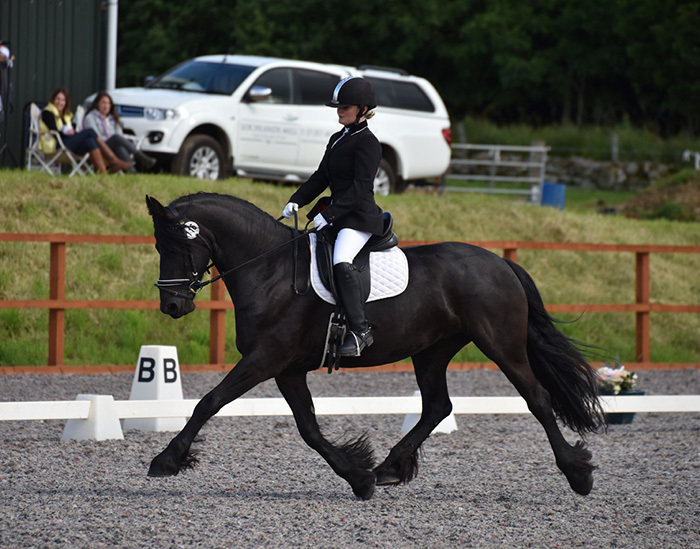 For more information about taking your Friesian affiliated or to tell us about your dressage experiences, please contact our Dressage representative, Helen Sinclair - helensinclair@fhagbi.co.uk.